American Hustle gets a 94 percent positive rating on the Rotten Tomatoes website, but I can't agree that it's really that great. Christian Bale as a chubby hustler and his girl played by Amy Adams build exceptional character studies. Bradley Cooper as an FBI agent, Jennifer Lawrence as Bale's dumb-ish wife, and Jeremy Renner as the mayor of Camden, New Jersey turn in performances that are almost as good. The problem is that the plot meanders along and the hustle the group plans isn't all that interesting. Perhaps that's because it's loosely based on the Abscam FBI investigation of the late 70s in which several prominent politicians actually did go to jail. A little more fiction or creativity might have made this movie better. It seems to aspire to a Pulp Fiction kind of noir, but it lacks the twists and humor to pull it off. All that said, this is an enjoyable film. Just keep your expectations in check heading into the theater. It was a robust year for music (as always). There is barely enough time to listen to all these albums, let alone many of the all-time great discs. There is lots to choose from here. But if you are a fan of hook-laden pop/rock music, don't hesitate to start with dropping everything you're doing right now and go buy the top 10 on this list. Then you can make your way to discovering 11 through 90. Much like my list of 2011's Top 70 Albums, Girls beats out Yuck for the top spot. 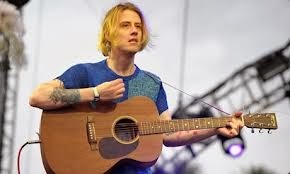 This time, it's Girls' lead singer Christopher Owens' underrated solo album at #1 (made even more personally amazing after being blown away by his intimate show at the 9:30 Club). But Yuck gets some laughs too, because their album is at #2, which is incredible considering former leader Daniel Blumberg's breakway solo debut by his new band Hebronix clocks in at #3. To listen to lots of highlights from this list, check out my free Spotify Best of 2013 list. 23. The Polyphonic Spree – Yes, It’s True. You may have noticed a distinct lack of world travel blogs lately here at Pop Culture Lunch Box. It's true, I haven't been going to excellent places of old like South Africa, Thailand, Tanzania, and Brazil, but you know, I've never spent much time in Philadelphia, a mere 140 miles from Washington D.C. And it's a fun place. Especially on a 70-degree December weekend! Well, that's if you don't talk about the ridiculous traffic. It took us more than four hours to get there Friday afternoon, much of that at a standstill in the few blocks approaching our hotel. And what a hotel. The Union League of Philadelphia, voted "the best city club in the country. "It was founded in 1862 "to support the policies of Abe Lincoln." He was a member, as was William Tecumseh Sherman and Ulysses Grant. Today, it is members only and "remains a bastion of the elite." It is the "oldest and most prominent of the remaining loyalty leagues." The lovely couple Tom and Tara, who know how to throw a wedding party. I never even got tired of dancing! Saturday we mostly stuck around the downtown district, although the wedding itself was in a Catholic church in the old downtown section near Independence Hall and the Liberty Bell. We made it back over to see those landmarks on Sunday. And Jackson insisted that this part of the trip was pretty boring compared to jumping on the hotel bed and getting candy from a street merchant. Capital Bikeshare (on my shirt) hits Philly! Give the kid some credit. He appreciates himself some Honest Abe. Pat's. That says it all. And what would a trip to this legendary town be without stopping in South Philly for Pat's cheesesteak? It's been several years since I had one, but cheesesteak with Cheese Whiz and "wid out" (meaning "no onions") is delicious. It's kind of like Imo's Pizza in St. Louis. You can't possibly imagine why it's so good and why it is so difficult to replicate. The TV miniseries certainly still hit me over the head like a sledgehammer. I’ll always remember Kunta Kinte’s plight and will always feel bad for all slaves and puzzle over how some people can be so downright bad, or at the very least clownishly imbecilic, with a big dose of sadistic. It’s still happening all over the world today. Unfortunately, slavery in some way will probably always be happening. So then Django Unchained was released. With Argo, that was my favorite movie of 2012 (in fact, I named it my 67th favorite movie of all time). This attacked Roots-era, pre-Civil War-era slavery with an eye for how violent it was and how ruthless. It added a huge dose of Tarantino humor and his style of the unorthodox. Despite that overlay, it was powerful. That’s why it was so good. But then along comes 12 Years a Slave. This blows Roots and Django out of the water. There were loud sobs throughout the theater. I personally don’t think I’ve cried that hard since E.T. (seriously, I’m not making light, I always cry during E.T.). So it’s a sad story, to say the least. It’s on-fiction based on a book written by Solomon Northup, a wonderful family man and talented and free musician from Saratoga Springs, New York who was recruited to tour the East coast in 1841 before getting kidnapped in Washington D.C. He was one of the few kidnapped slaves to ever escape captivity, which he does after 12 years at a string of hellish plantations throughout Louisiana. 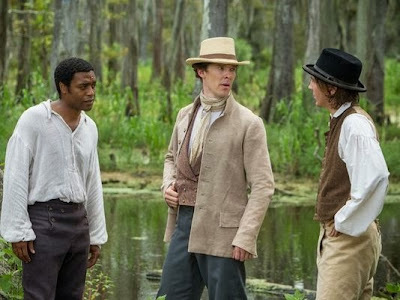 It will be a crime if Chiwetel Ejiofor, as Solomon, doesn’t win the Oscar for best actor. This is a very important movie, and I’m really happy, in my grandfather’s honor, that, at least judging by Hollywood, we’re getting closer and closer to coming to terms with our country’s ugly past and moving forward into a much more tolerant understanding and appreciation of all our differences and similarities. Appropriate just wrapped at Woolly Mammoth in Washington D.C. and it is exhibit B of a triumphant return – after a series of questionable productions over the past year or so – as the city’s best theater company. Following the also-excellent Detroit (exhibit A), Appropriate delves into comedic drama, with black playwright Branden Jacobs-Jenkins examining white siblings gathering with their families in Arkansas to determine what to do with their deceased father’s hoarded belongings in his decrepit mansion. Wild child Frank (played with Stanley Kuwalski-like furor by Tim Getman), Bo (a Jack Nicholson-like, cell-phone addicted, big-bucks New Yorker), and nasty racist-like-her father Toni (the always-excellent Deborah Hazlett) discover possessions in their father’s house that lead them to confront whether their family has a history that includes KKK involvement. The fact that Jacobs-Jenkins is able to keep the play from turning overly dark is a testament to his writing talent and gives Appropriate the stunning power to – hopefully – further our societal conversations about race and equity.